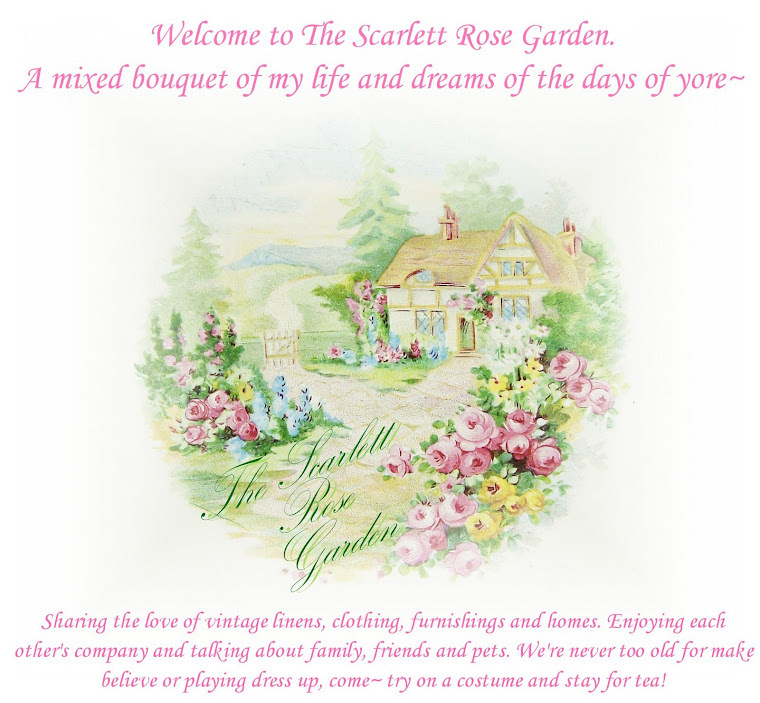 The Scarlett Rose Garden: Pink Saturday, Episode Three! 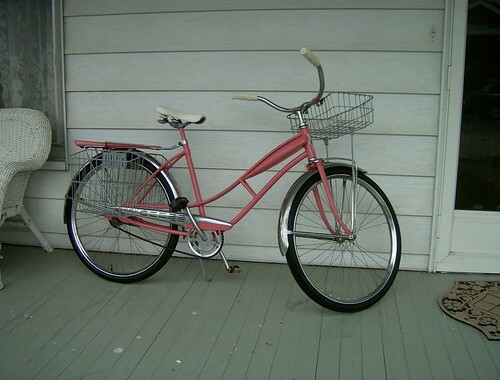 Today I'm sharing my vintage PINK bike! Isn't it cute!? It was salvaged from the house they dozed down caddy-corner from my house. My Dad painted it up for me for my birthday this spring. If I remember right, the color I chose was Watermelon from Krylon. You can read about the dozed house in this post. She doesn't stand up to well on her own. I need to find her a new kick stand. Those pics were taken on a dreary day, and before the house and porch were painted. Check out the difference! The bike used to be a dark royal blue, & unfortunately I didn't think to take any before pictures. It is an old Western Flyer. If anyone can tell me the year, please do! I've been searching everywhere. Your porch is great too. You have certainly done a lot to your home. Are you doing the "Our Favorite Things" party that Cindy (My Romantic home) started? 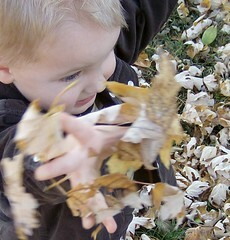 Just another great fun way to see a bunch of different blogs. The bike is really neat looking. I like the color. Your dad did a great job painting it. It looks like new. I love these pink bicycles. What a perfect way to have fun. Your porch is so pretty and inviting. I love your bike and would have loved to see pictures of you riding it. What? You think you always have to look like a supermodel? Have you seen some of the pics I've posted of myself? Downright scary! Another pink bike! I want one too! Happy Pink Saturday!! I am salivating over this bike. I love the pink bike! What fun to take a ride on that. Or sit on your lovely porch! I just ADORE your pink bike. I would love to find one like it. So sweet! What a nice thing for your dad to do for you. Oh I love the pink bike! How cool! It would have been so much fun to see pics of you riding it. So is that what you have it for, for riding? Or are you using it as decoration? Love your bike and the shade of pink is so pretty! Your dad did a great job, it looks new! Your porch is quaint and welcoming! oh I've been looking everywhere for a vintage bike! LOVE YOURS! The watermelon pink on the bike is great! I like the green too, but love the pink! Cute post! Your bike is just to great for words. It reminds me of the beach cruisers I see at the coast. Have I mentioned how much I love your porch? Well, if I haven't...I love your porch! Love that pink bike, s-o-o-o-o cute. Your bike is so darling. I don't think I've ever seen that model before but did you try looking through the 50's. It looks 50ish to me. I love period clothing and wish I could wear costumes everyday, but alas, people would think I was strange so I get away with what I can. I once took a History of Costume class in school and absolutely loved it! You had asked about my hat...would you believe it's fabric hot glued to the outside of a grocery bag? I made some for a little girls tea party and everyone fell in love with them so I just keep making them :). You live in an old Victorian...I am sooo jelous (how do you spell that word)? Oh, I LOVE your pink bike!!! That basket would look favulous holding pink flowers and trailing vines :) Hope your Pink Saturday was the best! What a great pink bike! Perfect for your pink saturday post! Love that watermelon pink bike! Love the pink bike, I can just see you riding it. HI! I love your pink bike! How cool your dad painted this for you! 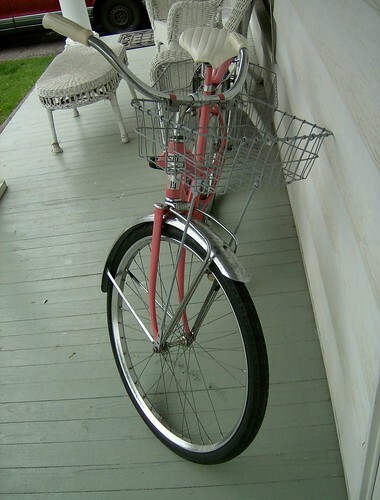 We are working on painting an old Coaster bike pink! Mine is all apart in our shop...just need some TIME to finish it! Thanks for visiting my blog and entering in my blog giveaway!